As a kid, I always wanted to build a 'super modified' t-jet, just like the ones in the magazines. Well, I wrecked a few chassis trying to build one as a kid, and that scared me from trying this again for years. I have finally gotten around to building the car I always wanted. This car started as a hand-picked, fast running open rivet, stock T-jet chassis. AFX style 'windows' cut into the chassis to reduce weight and help cool the arm. Radically cut gearplate to reduce weight and again help arm cooling. AG&G 'quadra-lam' clone armature, 5 degrees advanced for higher top end. JL Magnets, lightly sanded to fit chassis. RT-HO CNC machined idler and driven gears to help lower center of gravity, and to reduce rotational mass. Gears have also been polished, beveled, and lapped. AJs vintage threaded rear axle, aluminum rims from a vintage set of 'spongies' (old nasty dired up sponge tires removed) with Wizzard (?) soft silicone Tuff Ones slip on rear tires. AJs vintage threaded front axle, 'Raider' aluminum front wheels and o-ring front tires. 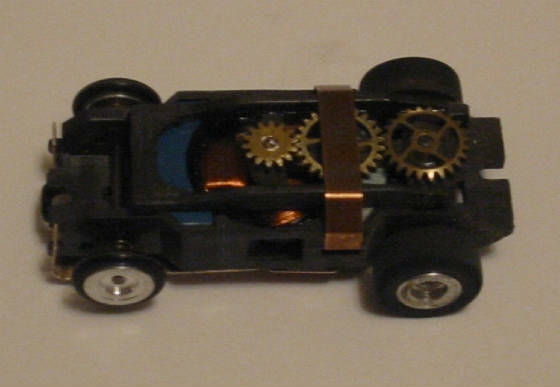 Front wheels are centered on the chassis using two AFX brush springs between the wheels and the chassis. I have been running the car with an MEV Mini Cooper body to keep the weight down, along with an aftermarket brass pan. The quadralam arm just arrived today (01-11-06) and MAN!! This baby is POWERFUL! I am in the middle of tuning and wiring my track. Once that is complete, I will finish up the Mini's body to concourse standards, and begin final tuning of the car. Independant vintage 'Raider' front wheels.